Question: My 4 month old is only sleeping for 45 minutes at a time! Then he’s only up for an hour and half and needs to go back down again. I feel like I’m spending my day putting down and getting up my baby. What can I do to make him sleep longer? As frustrating as 45 minute naps can be, sometimes they’re just normal. Some people will tell you that 45 minutes is not long enough and your baby is waking after his first sleep cycle (sleep cycles are usually about 40 minutes long) and you NEED to get him to sleep longer. But, I disagree with that advice. For some babies, yes, they do wake after 40-45 minutes and need a little help getting back to sleep until the break the early waking pattern. But for some babies, that’s just what they do. Here is how to tell if the 40-45 minutes nap routine is wrong for your baby, and they need more sleep. Try comforting your baby without getting him out of his cot. Make sure he is swaddled well and when he wakes place a firm hand on his chest and gently pat his bottom or shoulder with your other hand making a shhhh sound. If his eyes start to flutter or he looks tired, continue and see if he will go back to sleep. 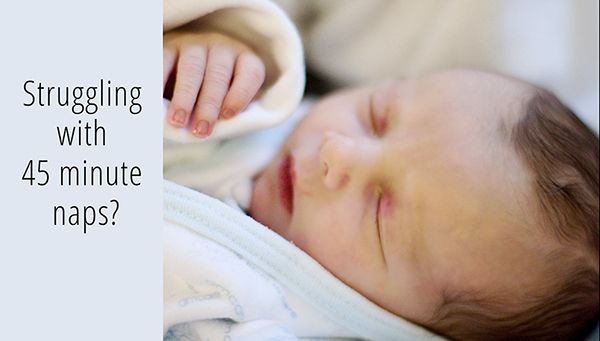 You can also try white sound or ‘sleep sounds’ that may help your baby get through their transition. You can download some free baby sleep sounds from Amazon, here.If he is wide awake, looking up at you, fully alert and smiling … he is most probably not tired and will not go back to sleep. Get him up. 45 minute naps can also be a sign of being over tired OR under tired (confusing, right?). Try putting him down 15 minutes earlier than normal, and see if he sleeps for longer. It can be helpful to try this for a couple of days so you can properly assess any patterns that emerge. Next, try keeping him up for 15 minutes longer and see if this helps him to sleep for longer. If you try both techniques for a couple of days with no success at all, then it probably isn’t a results of being over tired or under tired. If your baby falls asleep at night and does not wake after 40-45 minutes then it is an indication that he is NOT in a bad habit of waking unintentionally at the end of a sleep cycle. If your baby has some long sleeps during the day and some short sleeps, then it indicates that the 40-45 minute cycles is not a problem (unless they are waking from this nap still tired and crabby). If your baby is waking from his nap generally happy, then the 40-45 minute nap is not a problem. While 45 minute naps aren’t ideal, there is usually nothing wrong with them as long as your baby isn’t waking tired and cranky and getting tired as the day goes on. Most babies start to sleep for longer periods during the day as their naps consolidate, and by 9 months of age the 45 minute nap monster has usually disappeared. As a general rule of thumb, the shorter the naps the more frequent they should be. If your son is only sleeping for 45 minutes at a time he is not making up the energy he needs for a long awake time. Staying awake for one and a half hours before the next nap is totally normal for this age (see the awake time chart). If you try and extend his awake times to get him to sleep for longer, this will probably backfire and just make him overtired. Remember that the first awake time for the day should be the shortest, so perhaps try putting him down after an hour or an hour 15 minutes for his first nap of the day, and this will help to ensure he doesn’t get more tired as the day goes on.